Head back in time to join a lonely RAF pilot as he tries to make it home for Christmas. Late As it Happens co-host Al Maitland's reading of The Shepherd is an annual CBC Radio tradition that goes back to 1979. It is by far the most popular reading on As it Happens, with listeners writing in every month to make sure the show doesn't forget to play "Fireside Al's" dramatic reading of the short story. The story is a first-person account of a Royal Air Force pilot trying to fly home to England from Germany in time for Christmas in 1957. A couple of years ago, we decided to try to track the path the pilot narrator assumes in the story. The Shepherd begins with the pilot lifting off from an RAF airbase with the call letters "C-E-L-L-E". 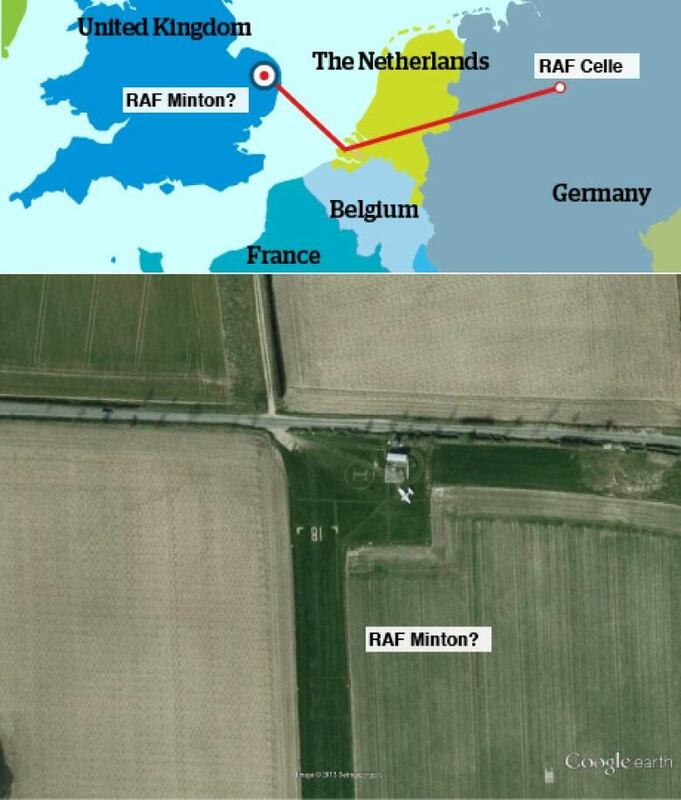 According to Ross Mahoney, an aviation historian at Royal Air Force Museum: "RAF Celle was an airbase in Germany used by the RAF until 1957 when it was handed back to the Germans." 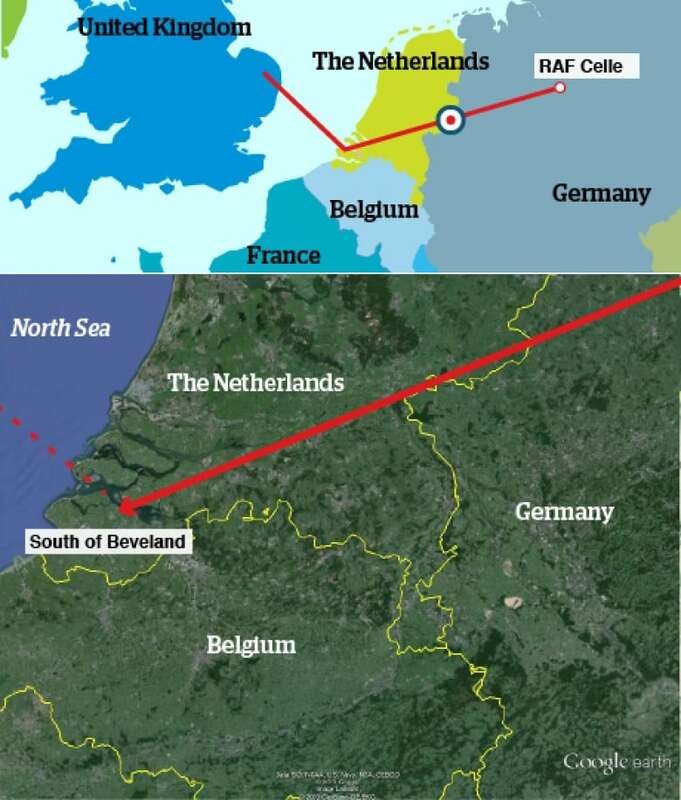 Once airborne, the pilot plans to fly toward England by taking "a straight run over the Dutch coast south of Beveland into the North Sea." Beveland is a municipality in the southwest corner of The Netherlands. The website for the municipality describes Beveland as: "The ideal place for watersports and include active simultaneously endless island to enjoy peace and quiet." "Discover the beautiful beaches and the hiking and biking trails that take you along the pearls of the island, such as the nostalgic shops, galleries, laminated, birdwatch and beautiful vistas." After passing through the Netherlands, our narrator is over the North Sea. It's here, that his Vampire airplane blows a fuse and he finds himself flying without a radio or lights toward Britain. Beginning to run short of fuel, he decides to fly to Norwich, a city in eastern England, because he will be able to recognize the terrain. 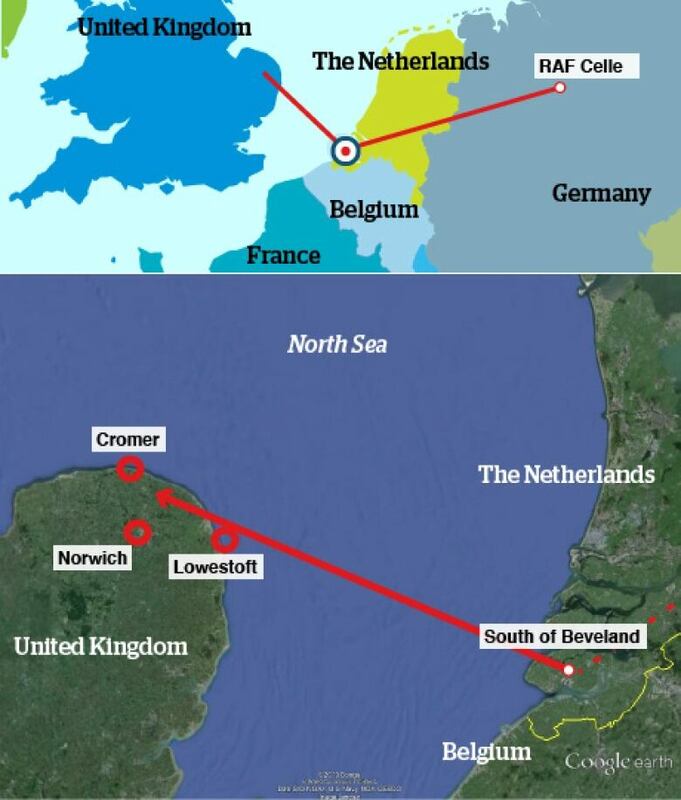 "I could identify the great curving bulge of the Norfolk coastline from Lowestoft, round the Yarmouth to Cromer, I could find Norwich, the only major sprawl of lights set twenty miles inland from all points on the coast." Almost out of gas and over the North Sea, our narrator runs into the mysterious de Havilland Mosquito, an old Second World War bomber, which will shepherd him back to safety. He thinks he's being guided toward the RAF base called Merriam Saint George. However, once he lands, our pilot discovers that he is at a small airfield called RAF Minton, which he describes as "old stores depot Minton, with its cobwebbed runway lights" and a "drunken commanding officer." There is no RAF Minton, because Forsyth invented it. However, he leaves a good clue as to where it might be. "Where is RAF Minton, exactly?" I asked him. "Five miles in from the coast, inland from Cromer." Cromer is a small town just up the coast from Norfork. 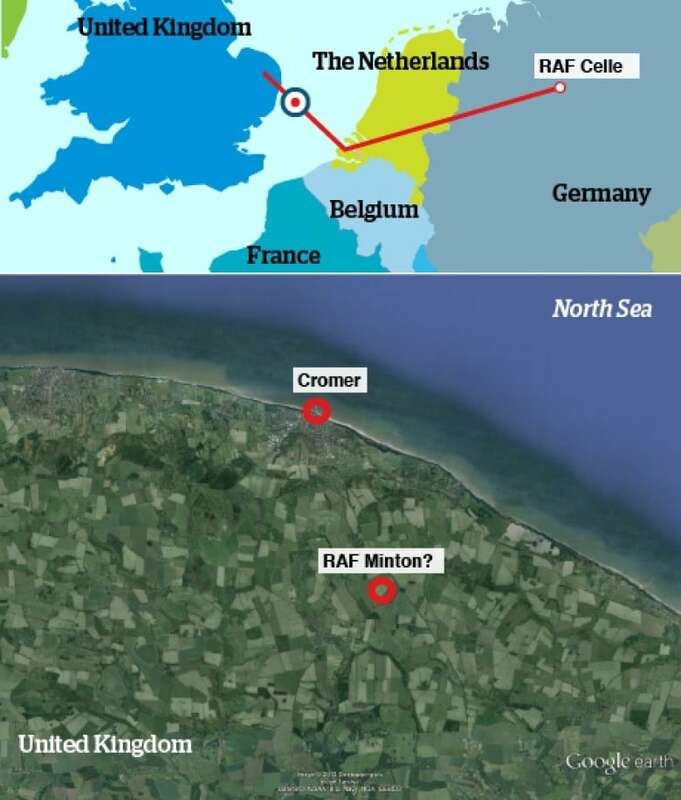 There is no record of an RAF base located there, but a bit of research uncovered an airfield about three kilometres from Cromer. It's doubtful this is the airfield Frederick Forsyth had in mind but, nevertheless, it provides a place for our Vampire and its pilot to land. 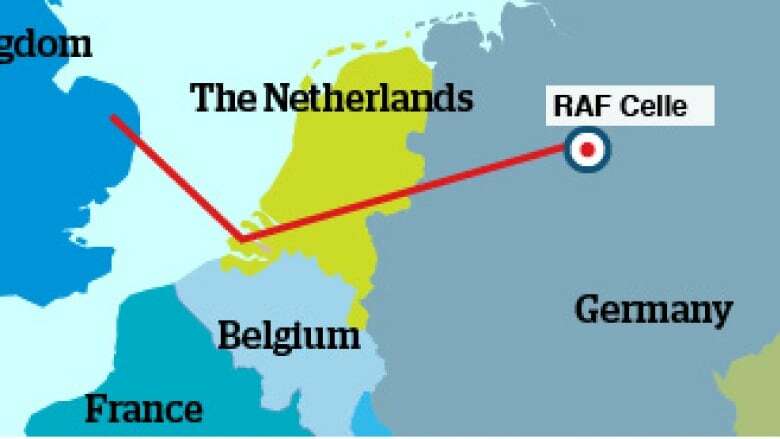 Based on the amount of gas he had left in the tank, the total flight took 80 minutes, taking him from western Germany to the east of England.